Hanukkah is the time of year to revel in fried foods. The experience of celebrating Hanukkah need not be eight nights of eating the same potato latkes. Below are eight distinct specialties to try, one for each night. After their expulsion from Spain and Portugal in 1492, the Sephardic Jews moved to Greece, Turkey and the Balkans. Their food had the characteristic spices of Spain and Portugal such as cumin, cinnamon, cardamon, turmeric, cilantro and Early Purple Orchid powder. 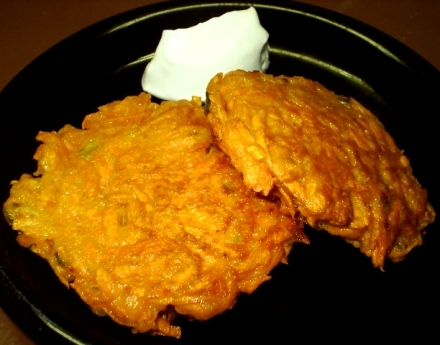 Leek fritters are originally from the Balkans and are traditionally prepared in Sephardic homes for Hanukkah. Cut leeks lengthwise, wash well to remove grit. Dice and steam for 5 to 7 minutes until tender. Lightly toast pine nuts in hot skillet. Set aside. Heat oil in nonstick skillet. Sauté onion, garlic and shallots until soft. Mix all together in bowl, add eggs and enough breadcrumbs to bind. Season. Add pine nuts. Add the Parmesan cheese. Fry in hot oil, a few minutes per side. Drain on paper towel. Bimuelos, or fritters in Ladino, are doughnuts in syrup. Inhabitants of the Mediterranean have been frying them in olive oil for about two thousand years. This recipe is from The Book of Jewish Food by Claudia Roden. Syrup: Simmer the sugar, water and lemon juice for 15 minutes or until thick enough to coat a spoon. Add the rose or orange blossom water and simmer a few seconds longer; cover and chill. Dough: Dissolve the yeast and sugar in about 1/2 cup warm water; let stand 10-15 minutes or until it froths. Put the flour in a large bowl; mix in the salt and yeast mixture. Stir in the remaining water gradually and beat vigorously for about 10 minutes, until smooth and elastic. Cover with a damp cloth and leave to rise in a warm place for at least 1 hour. Beat the batter once more and let it rise again. Make the fritters in batches. Put balls of dough by the teaspoon or tablespoon into 1- 1/2 inches of sizzling oil and fry until puffed, crisp and golden, turning them to brown evenly. You may find it easier if you dip the spoon in oil so that the batter rolls of easily. Lower the heat a little to give the fritters time to get done inside before they are too brown. 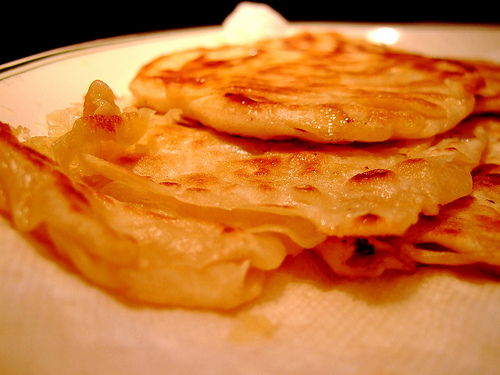 The batter is light and produces irregular, rather than perfectly round shapes. If the oil is not hot enough to begin with, the batter tends to flatten out. Lift the fritters out with a slotted spoon, drain on paper towels and dip them in the cold syrup for a few seconds (you may let them soak in the syrup a little longer). Jews have lived in Italy continuously since Roman times, when emperor Titus deported them from Judea to the south of Italy and Rome. This is Edda Servi Machlin’s recipe from her book The Classic Cuisine of the Italian Jews. Place rice in saucepan with the water and salt and bring to boil. Lower heat to simmer, cover, and cook, without stirring, for 30 minutes, or until rice is well done and quite dry. Remove from heat. Stir in raisins, nuts, and lemon rind. Cool for at least 1/2 hour and then add the eggs, mixing well. Heat half the oil in a large frying pan. Drop rice mixture into oil by the rounded tablespoonful. Fry two to three minutes on each side; fritelle should be golden brown. Drain on paper towels. The frittelle can be rolled in sugar, or sugar and cinnamon. 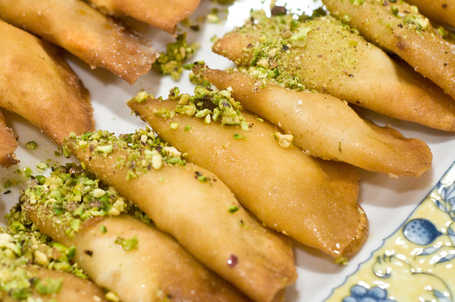 Atayef, Syrian Pancakes With Sweet Cheese Filling. As in other Jewish communities, Syrian Jews honor Judith during Hanukkah by eating dairy dishes. During the days of the Maccabees, Nebuchadnezzar, the king of Assyria, sent general Holofernes to attack Judea. Judith, a beautiful young widow, enticed Holofernes to eat salty cheese and drink wine. When he was drunk, she decapitated him with his sword and thus terrified the rest of his soldiers into fleeing Judea. This recipe is from Poopa Dweck’s book Aromas of Aleppo, The Legendary Cuisine of Syrian Jews. Mix together the dry ingredients. Stir in the egg, then add water until you have a thin pancake batter, about like a crepe batter. Heat a griddle or large frying pan to medium and grease lightly. To make the pancakes, spread on 1 tablespoon of batter and use the back of a spoon to quickly form it into a 3" circle. Cook until bubbles just appear on one side. Do not flip. Remove it from the heat and place in a single layer on a baking sheet or work surface. (Your goal is only to make the crepe firm enough to be filled, you don't need it to be fully cooked.) Do as many at a time as you can handle without overcooking. For me that was only about 4 at a time but they go quickly. Fill each pancake with 1 teaspoon of ricotta. Do not overfill! Fold in half and seal with your fingertips. You can freeze them in a single layer at this point until you are ready to use them. For the final cooking, heat about 3/4 inch of oil in a smallish saucepan. Fry the atayef in small batches until deep golden brown, about 3 minutes. Remove with a slotted spoon. Douse with the shira syrup (see recipe below), and dip the tip in the pistachios. The shira should be very cold to prevent it from ruining the crispiness of the pancakes. Serve immediately, while still hot, and experience joy! Boil the sugar, water and lemon juice for about 15 minutes. To tell if it is thick enough, spoon out about a teaspoon (carefully!) and let it cool a bit, then see if it is close to the consistency of honey. Allow to cool, then add the rose water or orange blossom water, and refrigerate. Bukhara is a city located on the Silk Road, in Uzbekistan. Bukharan Jews arrived after the Babylonian exile, in the sixth century BCE. They had no contact with other Jews for two thousand years and believe that they can trace their ancestry to the Lost Tribes of Israel. Their cuisine is a fusion of Indian, Chinese, and Middle Eastern influences. Toss walnuts, butter, & sugar. Set aside at room temperature. Put flour in a large mixing bowl. Make a well in the middle and pour the water into the well. Add salt and half of the butter. Slowly stir the flour into the liquid in the well until it is absorbed. At this point, beat the mixture firmly until a good firm dough is made. Make the dough a ball. On floured surface, roll the ball out into a rectangle approximately 18" x 16". Brush the dough with the remaining butter and fold into quarters. Roll it out again as thinly as possible. Cut dough into a rectangle 18' x 16" then cut into 2" squares. Place a teaspoon of walnut filling into the center of each square then draw up the 4 corners to the middle. Pinch the corners together to seal. Heat oil to 375 degrees F in a deep pot or a frying pan. 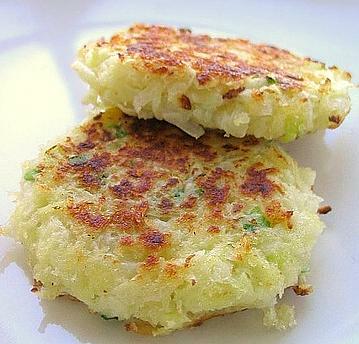 Drop in 8-10 fritters at a time and fry them for 3 minutes. Remove to draining rack. Sprinkle with the Confectioner's sugar and serve. This recipe is from Giora Shimoni. This is a very old Hanukkah recipe. It is said that the Maccabees ate cheese pancakes fried in olive oil during their battles against the Greek-Syrians. Beat eggs with milk. Add cottage cheese. Mix matzo meal with sugar, salt and cinnamon. Add to egg mixture and beat. Pour 1/2 inch of oil into a frying pan. Heat the oil over medium-high heat. Carefully drop 1/4 cup of the pancake mixture into the hot oil. Flatten the pancake slightly so the center will cook. Fry for several minutes on each side until golden brown and cooked through. Drain on paper towels. India has three distinct Jewish communities. The first Jews who came to India were traders from Judea who settled in Cochin 2,500 years ago. They were joined by exiles from the destruction of the Second Temple. The second Jewish community in India is called the Bene Israel. They left Palestine in 175 BCE and were shipwrecked in the Indian Ocean. They settled in Bombay, assimilating local customs while clinging to the Jewish traditions of Shabbat, Rosh Hashanah, Yom Kippur, Simchat Torah, and the laws of Kashrut. The third wave of Jews to arrive in India is called the Baghdadi Jews, even though they came from Iraq, Iran, Afghanistan, Syria, and Yemen. These traders arrived in Calcutta and Bombay 250 years ago. These Jews maintained the kosher dietary rules while incorporating native flavorings into their cuisine. These three communities were unaware of each other’s existence until the eighteenth century. Hot chili, garam masala, coconut milk, ginger, coriander, fenugreek, mustard seed, and curry leaves were new and exotic flavors discovered in India by these Jews. Jalebi has been cooked in India for about 700 years and is one of the most popular and festive sweets. Each of the Indian Jewish communities adopted it independently of the others. Mix the flour, baking powder and yogurt into a batter and set aside for 24 hours to ferment. Pour batter into a ketchup dispensing bottle. Make sugar syrup: Melt the sugar with the rose water and boil to get a one thread consistency. To check for one thread consistency, carefully dip the tip of your index finger into the syrup, touch your finger and thumb together and gently tease apart. If one thread is formed between your finger and thumb the syrup is done. Turn off heat, add the saffron strands and cardamom and stir well. Heat the oil in a deep wok-like dish. To test for the right temperature, drop a small amount of batter into the oil. If it sizzles and rises to the top of the oil, the oil is hot enough. Keep the heat on medium at all times to ensure all round cooking of the jalebis. Now hold the ketchup dispenser over the hot oil and squeeze the batter into the oil into a wiggly, randomly coiled circle. Squeeze out several at a time. Fry till light golden and then remove and put directly into the sugar syrup. Allow to soak for 2-3 minutes and then remove. Serve warm. Yemen is located on the southernmost tip of the Arabian Peninsula. The first Jews were sent to Yemen during the time of King Solomon. They sailed the length of the Red Sea to Yemen to find gold and silver for the Temple in Jerusalem. The Hebrew preserved by this community is said to be the most authentic articulation of Biblical Hebrew. The majority of the Jewish community of Yemen was flown to Israel in the summer of 1949 on Operation Magic Carpet. With them came malawach, now a staple in Israel. Mix everything except the margarine together, knead a bit for smoothness. Then let the dough rest, covered, for 3 hours. Divide the dough into 8 pieces. Flatten out one piece to about 6 inches in diameter. Incorporate about 2 teaspoons of margarine into the dough circle, pushing and kneading it in but maintaining the circle. Cut a line open from the center of the circle to the outside edge. Take one end and roll it around counterclockwise into a ball. Flatten out the dough to about 10 inches in diameter to make a pancake that is not more than 1/4 inch thick. Heat the olive oil in a skillet over moderate heat. Fry the pancake until brown and crisp, for about 5 minutes on each side. Serve the malawach hot, straight out of the pan, with the tomato-schug dipping sauce. Cut and discard the visible, leafless stems from the cilantro and parsley. Wash and pat dry. Place the cilantro and parsley in a blender with the remaining ingredients. Blend at low speed, stopping often to smash down the ingredients as they combine. Turn up speed and blend thoroughly. Mix one teaspoon (or more to taste) of schug into one cup of tomato puree. Whether eating cheese latkes while dressed up like the Macabbees, or daring each other to dip malawach into the most schug, people celebrating Hanukkah may enjoy a great variety of deliciously decadent specialties. May each night of Hanukkah be a time of celebration and culinary discovery!